There is a fuse track designed into most of our controllers. This page explains the most common cause of the track blowing, and why it is present. This page uses the 4QD series to illustrate. Consider the diagram above which shows controller, motor, batteries and hand controls. When the motor draws current, this will cause (usually a lesser – see Battery and motor current ) current to flow from B+ through the controller out of B- and so back to the battery. Now the battery negative is often connected to chassis, as shown (point E). The problem will occur if there is also a chassis connection to any part of the control system. Commonly this may be because the hand control box is plug-in, and the body of the socket into which the hand control is plugged is used as an extra connection. In this case, if the connector is mounted on the chassis (as is usual) there will be a connection to chassis, shown as point F in the diagram. Such a system may work perfectly – until something goes wrong in the battery negative. A bad connection here will cause a resistance. Now the motor current may be tens, or even hundreds of amps. This will cause a significant voltage drop in this bad connection. Current tends to find the path of lowest resistance so with this bad connection current will flow as show by the red arrowed line, from controller’s B-, through the internal earth track, out of pin F on the controller, through the wiring and so to chassis through the input chassis earth. Input ends of circuit boards cannot be designed to handle this sort of current. But they can be designed to have a weak point, to limit the damage. This weak point is the earth fuse track. So, if this fuse blows you must locate the spurious chassis connection and insulate it. You must also re-make the fuse track with a suitably thin piece of wire: failure to do these will make it likely that the wrong earth track in the controller will blow next time, and this will not properly limit the damage, so the controller will likely not be repairable! On the 4QD series controllers the earth track to pin F on the control board is deliberately thin so that, in the event of this earth fault current, this track fuses and restricts damage to a safe point. The diagram shows this earth track – marked by the red ring. If it fuses it must be repaired by a suitably thin piece of wire (or, better, by a self-resetting fuse) a single strand from a section of 7/02 stranded wire is suitable. This has a diameter of 0.2mm and a fuse rating about 3 amps. Nothing thicker must be used as then another section of the earth track could fail in the event of this fault and the controller will probably be damaged beyond economical repair. 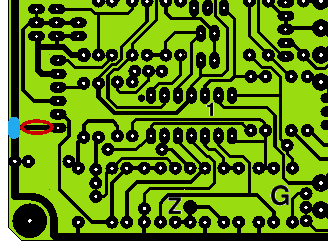 The green resist must be scraped off the peripheral earth track, at the point shown by the blue mark, so that the strand can be soldered between here and pin F of the connector.